UNL researcher Benjamin Terry holds a prototype of his team's tapeworm-inspired attachment mechanism, which adhered to the wall of a live intestine for six days. Give it a couple of hours – or better yet, about a week – to digest. In a tapeworm-inspired feat that redefines “intestinal fortitude,” University of Nebraska-Lincoln engineers have designed an adhesive mechanism that could allow ingestible cameras and biosensors to hang around the digestive system for unprecedented lengths of time. The researchers have published a study detailing a dime-sized device that latched onto the wall of a live, functioning small intestine for six days. According to the study, previous non-invasive designs adhered to dead intestinal tissue for a maximum of two hours. Much like the mouth of its parasitic counterpart, the team’s attachment mechanism features a vacuum-powered “sucker" surrounded by tiny needles that imitate the hooks a tapeworm uses to anchor itself inside the gastrointestinal tract. Lead author Benjamin Terry cited the mechanism as an example of bio-inspiration, an approach that piggybacks on the evolutionary innovations that nature has bench-tested over hundreds of millions of years. The attachment mechanism likewise caused no discernible damage or perforations in the intestine of a pig that carried it for six days. A commercial version of the device will track the mechanism’s location and orientation via an embedded sensor, Terry said. Once properly positioned, it will autonomously trigger a circuit that melts a wax seal and unleashes the suctioning power of an airless capsule bound to the mechanism. Equipping the mechanism with a biosensor would enable continual monitoring of temperature, pH levels and other factors that influence digestive health, the study reported. This type of prolonged data could inform the diagnosis of diseases such as cancer and eventually facilitate sustained delivery of pharmaceutical drugs. Terry said the mechanism could also serve as a long-term vessel for capsule endoscopes, the ingestible pill-shaped cameras that permit physicians to record images of the GI tract. “One of the shortcomings of current capsule endoscope technology is its relatively quick migration through the GI tract,” said Terry. “Pausing at a location of interest, such as a polyp or ulcer, is desirable. Our technology would enable this. Ironically, many of the obstacles to achieving this objective manifest themselves in another type of worm, according to Terry. The intestine’s problematic consistency, surface and wavelike digestive action call to mind the feel and movement of a giant earthworm, he said. Terry and his colleagues answered the question by testing numerous sizes of the mechanism’s sucker, along with the number and angle of needles surrounding it. They settled on a configuration that yielded the strongest adhesion – a hole five millimeters in diameter with six needles set at 45 degrees – before fabricating it with a 3-D printer. As Terry’s graduate students began examining the Manter Laboratory of Parisotology in an effort to better understand tapeworms, they also encountered curator Scott Gardner, professor of biological sciences. The team’s efforts will eventually entail shrinking the attachment mechanism by more than 10 times, according to Terry. Its more ambitious goal: extending the mechanism’s weeklong stay to months, a year or beyond. To do so, the researchers must contend with intestinal tissue’s slow but steady regeneration. That regeneration involves the production of cells that advance toward the organ’s surface before exploding in a burst of mucus. “This whole layer is continually migrating outward and sloughing off,” Terry said. “Then your body re-digests it, so you’re basically eating yourself continually. But when you stick something there, it’s going to constantly move outward and eventually get pushed off. That may be why the mechanism lets go after six days. The team’s study, which was published online in June, appeared in the journal Biomedical Microdevices. Terry co-authored the study with Wanchuan Xie, a graduate student in mechanical engineering and applied mechanics, and Vishal Kothari, assistant professor of surgery at the University of Nebraska Medical Center. Terry and Kothari are members of the UNMC’s Center for Advanced Surgical Technology, which seeks to develop innovative surgical technology through collaborative, interdisciplinary biomedical research. The researchers’ work was supported by the National Science Foundation and the Nebraska Research Initiative. 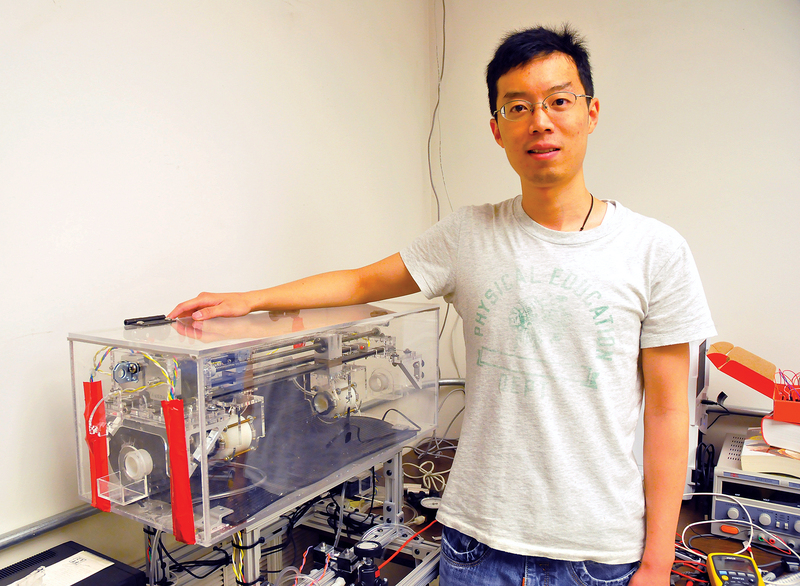 Graduate student Wanchuan Xie stands next to a simulator that allowed the researchers to test their mechanism prior to its placement in a live pig. UNL engineers used this simulator to mimic the wavelike motion of a small intestine.